Make your wedding drinks extra special with bespoke, handcrafted cocktail menus tailored to your wedding theme. Dazzle your guests with cocktails they have never tasted before, or put a unique twist on your all time favourites. 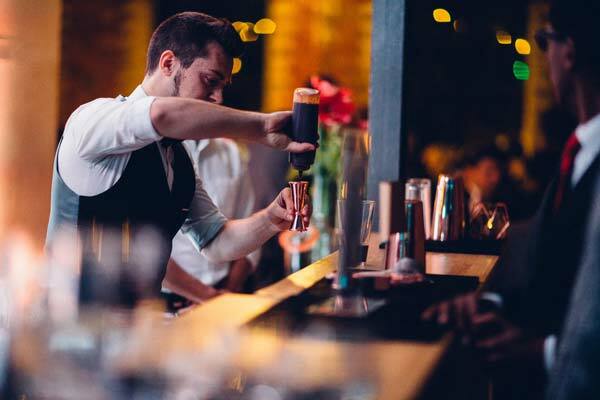 We take responsibility for the hire and delivery of all necessary items including the bar units, cocktail equipment, glassware varieties, stock & staff. This means you can focus your energy on other areas of the wedding. Moreover, setup and clear up is free so you have nothing to do on the big day but enjoy the moment. Our communication is quick and effective because we don’t want endless emails taking up your valuable time, especially when there are so many other important details to organise. We are honest about the products we can provide and only ever one phone call away if you have further questions. 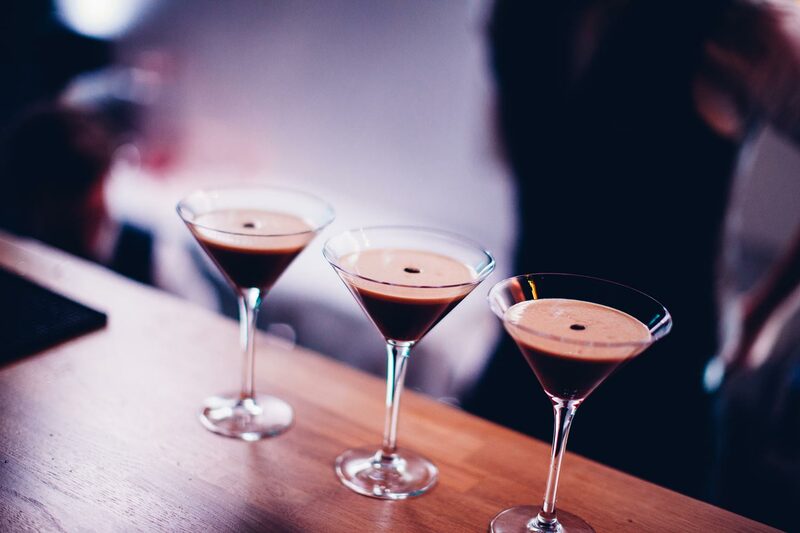 Weddings come in a wide variety of different styles, so we meet in advance to create a bespoke cocktail menu that matches you and your theme perfectly. 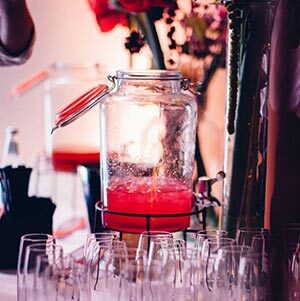 Whether you’re going all out or sticking to a budget, we know how to make sure you are 100% happy with each cocktail on your big day, and your guests have a great time. "Three Piece provided an impeccable bar service for our wedding. They were a pleasure to work with from the moment we spoke. Alex answered all communications promptly without exception, constantly offering creative solutions about everything from glassware and drinks recipes to staffing. He made a delicious homemade rhubarb gin for guests which was a hands down favourite, alongside beautifully made espresso martinis and Moscow Mules. The gin and tonics were carefully selected. Three Piece even made drinks menus using the font we chose for our order of service. 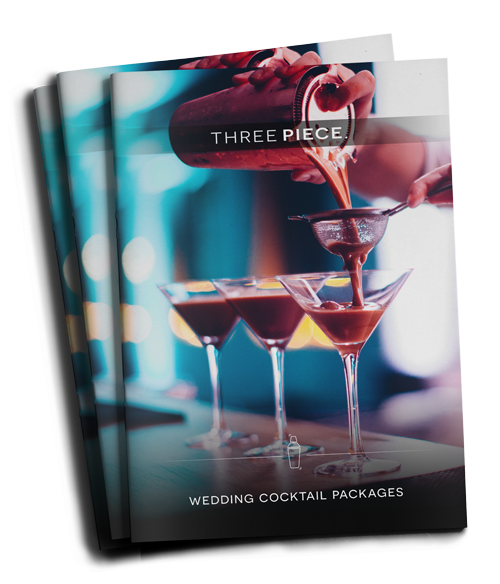 Their attention to detail, friendliness, flexibility and genuine desire to exceed a client's expectations means that I would wholeheartedly recommend Three Piece for any bar service." 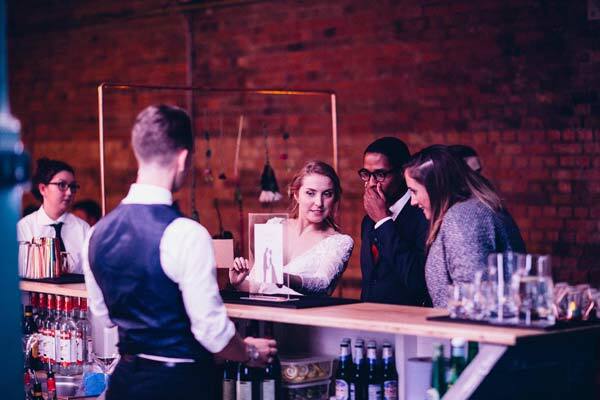 Our handmade bars are the perfect addition to a wedding venue. The wooden mobile bars are grey, shabby chic effect with solid oak tops, as you can see below. They are highly equipped for an excellent service from your mixologist, and simple to set up with no need for power indoors or outdoors. The locations we attend are based in Hertfordshire, Bedfordshire & Buckinghamshire but we can work with any event planner to serve at your chosen wedding venue. With all-inclusive drinks packages you can rest assured that every part of our service will be impeccable. The bar, cocktail equipment, glassware, ingredients, ice and staff is provided so you can enjoy the big day stress-free. We offer a variety of pre-paid packages, as well as cash bar hire with Apple Pay, Android Pay, contactless & all major credit card payments accepted. Get in touch to find out more about how we can help at your wedding.